Walking around by yourself is the best way to “create images” (not pictures) but having a guide can be even better. In my last post I told you how to study your significant others sleep habbits and use that time to go shoot on your own. Today we’re going to look at how a guide can help improve your photography. It’s been a few days since I posted. I’ve been working on some paying projects for my full-time business: Mark Gilvey Creative so I haven’t had a lot of time to go out and photograph. Once I got past the office work I got out and did a bunch of photography. I’ll have more to show in my next post. Some of you may have heard about a cruise ship that sunk in the Mediterranean in 2012 called the Costa Concordia. 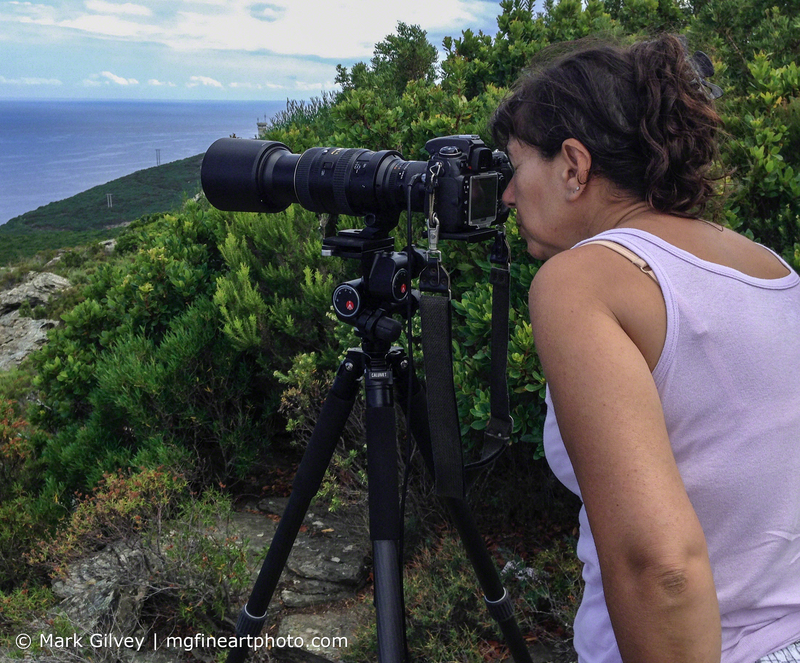 Our neighbor suggested we drive up Cap Corse (Cap = Cape) and find a vantage point on one of the mountains where I could take photos from. We drove about 20 minutes up the curvy route D80 and exited onto a smaller curvier road and then onto, what was more like, a trail up a mountain. There was a great view of the sea from there. I could see the cruise ship and the island of Elba as we looked East. The location offered a higher angle of view above sea. The sun was moving lower on the horizon behind us. Its rays seemed to cut through the haze that had been over the sea most of the day and shined onto the ship in the distance. I attached the longest lens I have to my camera body, an 80-400mm VR zoom. Then mounted the rig on my tripod with an electronic cable release connected to the camera body. Just for kicks, I added an old 2x converter (from the 1980’s) to it to see what 800mm could do for the shot. The 2x converter added a few problems including: chromatic aberration, image softness, and two ƒ-stops less light. It was everything a photographer just loves to see in their images – not! Also, all the controls (aperture and focus) had to be adjusted manually. The good news is it did get me a closer view of the cruise ship encased in its transport. My tripod is carbon fiber and very light, comfortable to carry, even with a camera body mounted to it but it was fairly windy on the mountain so I really needed weight to make sure it stayed still. The head on the tripod is pretty heavy plus with my camera and lens rig, the whole setup probably weighed in at 15 pounds. That said, it might have been nice to weigh the tripod down even more. I think I will look into getting a sack that will attach to all three legs where I can drop some local stones into it for extra weight. Another idea might be to make a hanging sack that can attach to the hook at the bottom of the center post. Marie Antoinette looks through the viewfinder of my camera mounted to 800mm’s worth of lens. She is looking at the Costa Concordia as it passes the East coast of Corsica. With an 800mm lens, any small move you make to the camera really affects where the image will sit in the viewfinder; it doesn’t take much at all to change the composition from great to terrible at this focal length. I know how much people love their “ball” style tripod heads. They are talked about as being the end-all head so much so that people who are thinking of getting a new tripod head do so purely because everyone else has one. I’m about to poo-poo your ball head. I have a Manfrotto 410 geared head that is absolutely a dream. It has a fairly small footprint because there aren’t any extension grips on it, only rubber grip knobs. Click the photo at right for an enlargement and you can see the head close-up. The great thing about it is, if I want to move just one axis, that is all I move, period! I don’t have to loosen anything else first and then move it—I just move it. It has quick releases as well so I can rotate it over long movements quickly, albeit one axis at a time unlike a ball head. Try rotating a super long telephoto and heavy camera about a milometer with a ball head or standard style tripod head—it’s impossible. You’ll always overshoot your position. This geared movement control was a big help for this shot. The electronic cable release kept my hands and my face off the camera body during the exposure. This was important because the shutter speed was set at 1/400th of a second which is at least two stops slower than I wanted for this particular shot, even on a tripod. Hand-holding the 800mm at 1/400th, even with Vibration Reduction would have been pushing the limits as well. I wanted to compose the image, let the camera rest and then take the shot; having the rig on a solid, sturdy tripod gave me that and the cable release made it virtually a hands-free process. Hand holding with a VR lens would have eventually made me tired and have to recompose almost constantly. Even on a monopod, there is still some side-to-side movement that I wouldn’t want. With all this in play, the image still isn’t as sharp as I’d like it. I do have another version without the converter but I have not processed it at this point. I posted a version of this image on my Facebook page that shows just the cruise ship; but there’s more to the story. The image below tells the whole story. There are two massive tugboats in front of the cruise liner pulling it a bunch of spectator boats and a trailing ship making sure it doesn’t leak any more fuel or oil into the sea. Click the preview for an enlargement. My wife wanted to know if I could make it more clear since it was 20km away and in Italian waters. I said this is as good as I can get it with this lens setup but if you want, I can purchase another lens that would get us even closer for photos like this—it would cost about $6000+. She said this shot looked great. I told you that story so I could tell you this one. Corsica is mountainous. You can be at the top of one and then on the beach in a few minutes drive. After taking this photo, I turned around and saw this panorama (video below). So I turned my camera around and took a multi-row panorama of this scene. It has everything it needs; lighting, composition, impact and color. We’ll see what I make out of the final pan in the future but for now, enjoy the view. TIP FOR THE DAY (Two of them): Don’t just point your camera in one direction. Turn around to see what else is going on around you. Sometimes, as you will see in my next post, moving in front of everyone also helps. Hector, our neighbor (and guide) knows all the great spots and I’m glad to have had him to show my wife and I this location. We were the only one’s at this spot. There were hundreds of cars lined up all along route D80 that runs along the coastline and most of them were stopped near a TV truck; everyone doing what everyone else is doing. Who knows where I would have ended up on my own. We really did go “Onward and Upward” for this. We stopped at a bar/gas station on our way home. Hector (left in blue tank top) gives his usual “you don’t need to thank me for anything” smile. My wife Marie Antoinette smiles and is probably wishing we were hunting for more sea glass that she can make jewelry from. Inside, customers and staff are gathered around the TV watching the Tour De France. Click for enlargement and you can see some of the other specials going on in the right third of the image. Sinking of Costa Concordia shaked the confidence into the cruise industry. Definitely it can be claimed as one of the biggest shipping accident in the recent years.